My name is René and I'm from the Netherlands. I'm in the process of converting my Celica GT-Four Carlos Sainz into a streetable track weapon and have been using a Starlet P8 for daily duties. I prefer early 90's Toyotas over the boring modern stuff but decided to go for something 'new' for a change anyway. As of last week, the Starlet has been replaced with a 2007 TS in fire red. As usual I've planned some subtle modifications before even buying the car, but due to other priorities (finishing the mancave) I am in no rush to upgrade the TS. So I'll probably continue lurking on here at first. ^ Mods include Volk TE37s, AP Racing brakes, STACK racing dash, C-ONE braces, etc. 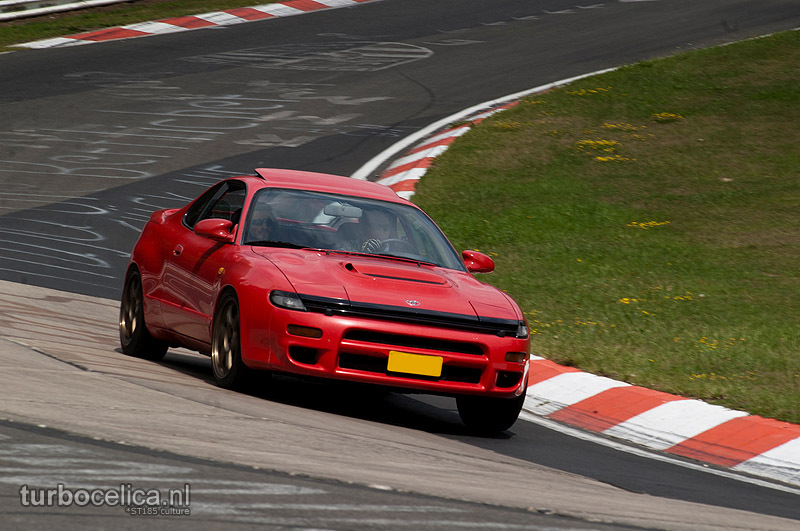 See Turbocelica.nl for loads of pics and info. Currently off the road though and fully stripped for a proper rebuild (FIA cage, fuel cell, carbon doors, new/reinforced everything). ^ Previous dd/tool on wheels. Manual everything, no driver aids. Mods (limited, since it's 'only the dd') include Enkei RP01 with fat AD08R rubber, Cusco Safety21 half cage and a low mileage engine after the first one blew a valve. Took it on roadtrips for work as well, soon to be decomissioned. ^ Quick phone pic: 2007 TS, ~60,000 km, 100% stock for now. Super clean inside and out, I fell in love at first sight. I'll post up better pics later. Totally different car compared to the Starlet I must say, with both advantages and disadvantages. I do like the feel of a proper car, but will it provide as much driving fun as the go-kart Starlet? Time will tell. Anyone happen to have a copy of Hyper Rev 108 for sale by any chance?